One of my favorite treats, from childhood to adulthood, has to be an ooey-gooey caramel apple. I can’t leave a fair or amusement park without getting an over-priced, but so delicious caramel apple. 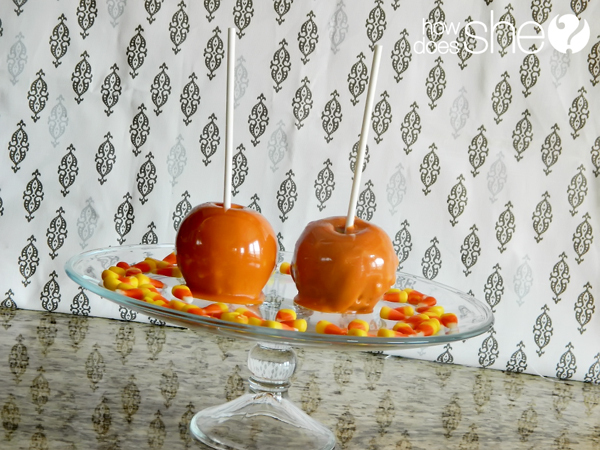 To add a Halloween twist on the classic treat, I made up this killer recipe for Candy Corn Caramel Apples. The secret ingredient…candy corns of course! Time out: If you are looking for an apple caramel dip recipe head over to a post that will make you drool! It’s amazing. Start with 4-6 large Granny Smith apples. I love the tart apples combined with the sweet caramel. Unwrap all of the caramels (the most time-consuming part) and put them in a large microwavable bowl. Next add the candy corns and evaporated milk. Microwave on high for one minute. Remove and stir. Microwave for additional 30 second increments until the caramels and candy corns are melted, but not boiling. It will make a fun, festive orange color that is a great contrast to the bright green apples! The easiest coating method I’ve found is to spoon the hot caramel onto the apples, starting at the top. It will drizzle down and you coat the rest of the apple and place it on waxed paper that has been sprayed with cooking spray. And that is the candy corn caramel apple! If you want to get festive and add some scrumptious toppings, a few suggestions are pecans, crushed oreos, Heath bits, and white and milk chocolate melting chips. One vital tip is to dip the apples into the toppings before the caramel hardens. White and milk chocolate melting chips are perfect for adding those spooky details, perfect for trick-or-treating or a Halloween party. Place the caramel apples in the fridge or freezer for a few minutes until the exterior is cold because it’s easier to add the chocolate. Meanwhile, melt the baking chips and add the melted milk chocolate to a piping bag. For the ghost, use a spoon to drizzle white chocolate from the top of the cold caramel apple. Place back in the freezer. When the white chocolate is cold, add milk chocolate eyes and a mouth using the piping bag. For the jack-o-lantern and spider web apples, use the piping bag of chocolate to draw those details onto the cold apples. And then dig in and enjoy because they are so good! Unwrap all of the caramels (the most time-consuming part) and put them in a large microwavable bowl. Next add the candy corns and evaporated milk. Microwave on high for one minute. Microwave for additional 30 second increments until the caramels and candy corns are melted, but not boiling. Wow – this surely is wonderful and something that one needs to try – especially with Halloween just round the corner. These look deliciously AMAZING! I love the Halloween themed ones. I am making these with the kiddos this weekend for sure. Little man will get a kick out of the ghost. These look awesome! I’m going to try them for our Halloween party next wknd….Any tips on how to store them? Thx for sharing! I wrapped them in saran wrap and they kept great in the fridge for at least one week. But maybe spray the saran wrap with cooking spray or possibly cut a square of wax paper to go around it so the designs don’t smash. Good luck! These look like something I can conquer! The kids would get a kick out of decorating these, I bet. Cute ghost! These look absolutely delicious and so professional looking. Yum! Oooh, yum! I want some! How many caramel apples were you able to make with this recipe? It made 6 good-sized caramel apples for me. Good luck! This is the #1 tip…always dip apples by their stick into boiling water and swirl for about 20 seconds, then dry with towel. This will melt the wax and allow the caramel to stick. I know, I’ve made over 75 for a wedding and the next day the carmel would all pool at the bottom of the apple. I wish I knew this trick then.